open-source GSM cellphone, which runs OpenMoko, based on OpenEmbedded. 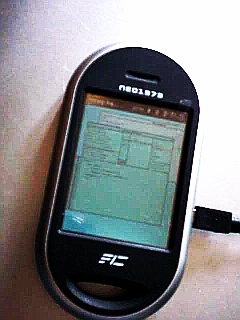 He used Squeak VM version 3.9, running a stripped 2.8 image (though he has also had a 3.9 image running), and is now looking at accessing the phone’s hardware, including GSM modem, GPS, Bluetooth, touchscreen, audio, battery and auxiliary buttons. Tony is working with the OpenMoko team to get the necessary changes integrated into the main code-base, making this an easier exercise for other developers to follow. He’s also looking at getting Spoon running on the phone. Keep an eye on the LShift blog for progress reports. Like this story? Why not add it to Delicious Reddit or Digg?